Identification: Females are much larger than males. Forewing is a blurry yellowish gray. 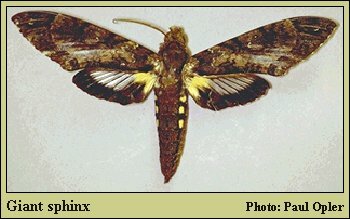 Hindwing is dark gray with yellow at the base and a dark "tooth" projecting from the margin into the translucent area between each vein. Wing Span: 5 - 7 inches (12.6 - 17.8 cm). Life History: Females lay eggs singly on leaves of various species of Annona. Caterpillars are large and have a horn at the rear end. Flight: . Several broods throughout the year in south Florida. Caterpillar Hosts: Custard apple (Annona glabra). Range: Resident in Florida and tropical America south to Brazil and Peru, rare in South Texas, strays as far north as Chicago. Conservation: Population status and habitat requirements should be studied in Florida.